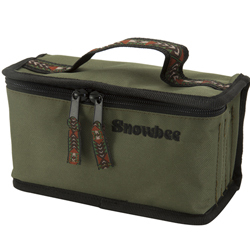 Snowbee Slimline Fly Box Kit, designed with the serious fly tier or fly fisher in mind, this innovative kit consists of five of our Slimline Fly Boxes, neatly stored in a zip-closed divider bag, taking up the minimum of space. 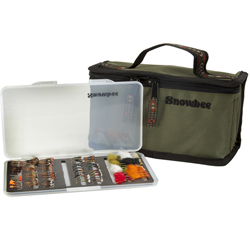 Between them, the five Slimline Fly Boxes will hold up to an amazing 1,170 flies in a carry bag of just 20cm x 12cm x 8cm (8" x 4.75" x 3.15") - enough for the keenest fly fisherman or fly tier! 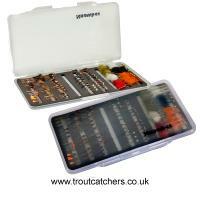 These boxes take up a lot less space than my old collection making packing my fishing bag much easier. Good for most patterns but I wouldn't necessarily use it for dry patterns.